Woodworking projects are often labor-intensive, even if they are a labor of love. You want to finish your project in a way that enhances its beauty and protects the surface. You have many choices, but linseed oil is a readily available, inexpensive option that is easy to apply. 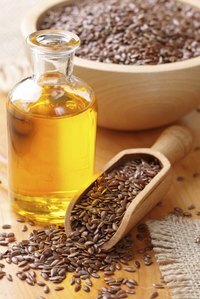 Made from the dried seeds of the flax plant, linseed oil is processed to speed up the drying time, producing “boiled” linseed oil. Pure linseed oil isn’t practical for wood finishing because it does not dry. The boiled product penetrates into the wood’s grain, which accentuates the pattern. In addition to creating a wet-looking surface, linseed oil is water resistant, malleable with the expansion and contraction of the piece during temperature changes, and it is easy to apply. Linseed oil makes surface blemishes more obvious, so you need to smooth those dings or nicks out. Sand the entire surface with fine and finer sandpaper until you reach 220 grit. When you’ve got the whole surface as smooth as possible, wipe away the sawdust with a soft rag or tack cloth. Use soft, lint-free rags to apply the oil; tuck any unfinished edges inside the folds. Apply the oil to the rags, not directly onto the wood to avoid flooding the wood. Start with the area that is hardest to reach and move to the most accessible to avoid leaving finger- or handprints by leaning on the surfaces to support yourself. Wipe the oil in the direction of the grain. You should not have to press hard or scrub the oil in. If you do need to do that, add more oil to your rag more often. Use enough to easily wipe onto the wood without leaving pools of oil. Allow the wood and oil to set for 30 minutes, and then rub the surfaces with a clean rag to remove any excess oil. Let the piece cure for 24 hours or until it is thoroughly dry to the touch. Smooth the surface with 0000 steel wool, and then repeat the apply-rest-wipe-dry-sand process two more times. Linseed oil is flammable, and your rags may spontaneously combust if not disposed of properly. Wash the rags very thoroughly before throwing them away or spread them on a non-flammable surface until they are completely dry. Also, be careful while handling the uncured wood. If you make a mistake or decide you don’t like the finish, you must sand it to remove it. Does Linseed Oil Help Preserve Wood?